GROUNDBREAKING ON THE EXPANSION OF VIRGINIA INTERNATIONAL GATEWAY IS IMMINENT: The volumes we are seeing are a clear indicator that we are adding capacity at the right time,” said John F. Reinhart, CEO and executive director of the Virginia Port Authority. The Port of Virginia set a new container volume mark in January. Port of Virginia volume grew by 17 percent when compared with last January. Port of Virginia had 12 consecutive months of volume exceeding 210,000 TEU. The Port of Virginia moved 228,516 twenty-foot equivalent units (TEUs) in January, setting a new volume mark for the month, growing volume by 18.5 percent when compared with last January and pushing the fiscal-year-to-date growth to eight percent. The port handled the heavy volume despite two lost workdays in January that were the result of a heavy snow at the start of the month. 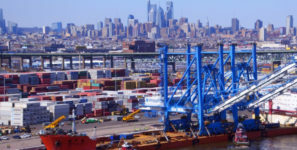 The continued growth comes as the port prepares to begin work on its three-year capacity expansion plan at Virginia International Gateway (VIG) and Norfolk International Terminals. In January 2017, the Port of Virginia handled 121,232 TEU in exports, up 17.5 percent compared with January 2016; imports were at 107,284, up 20 percent. Over 128,420 containers passed through the port, which was an increase of up 17 percent over January 2016. Rail containers amounted to 48,876, up 27 percent; barge containers, 4,320, up 42 percent; and truck containers, 75,224, up 10 percent. The Virginia Inland Port handled 2,960 containers, up 13 percent, and the Richmond Marine Terminal handled 2,125 containers, up 64 percent.